I think the people from Failblog are now very happy as we got to see a lot of fail videos in the last few days. We can remind a couple of them, namely the Honda Civic which caught fire while the driver was trying to make a burnout tied of a concrete block or the burnout made by a woman while she was trying to escape the cops. This time we talk about a group of young people having some fun trying to drive their Kia Sportage down a pretty steep hill. One of them decided to film this attempt and lately he realized that the situation got out of control. 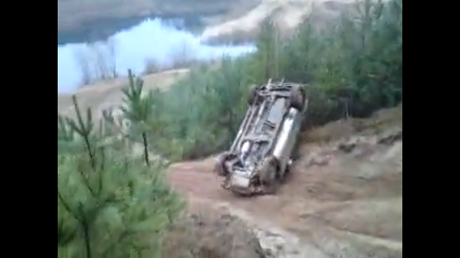 Above is a six minute video including the rescue operation of the driver but there are just 30 seconds of “fun” watching the vehicle while is tumbling down the hill. We can assume to make a joke on this happening as in the end we see the driver of Kia Sportage unharmed.